The second instalment of SNK's wildly popular Metal Slug series! 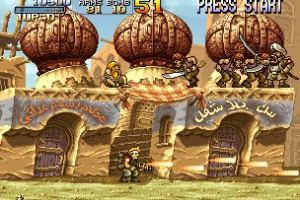 This game is a side-scroller which puts you in the boots of Marco, Tarma, Eri and Fio. Your mission: wiping out General Morden's newly remobilised Rebellion Army. 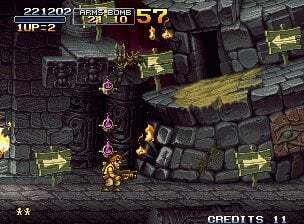 Just like in the original, players blast their way through levels by shooting and jumping - but Metal Slug 2 boasts an expanded arsenal for you to wield, including a heavy machine gun, a shotgun and even a laser gun! Not only that, but transformation effects are packed in as well - players turn into mummies after getting caught in poison gas coughed up by other mummies! Your characters can also become obese and slow, albeit with an attack strength upgrade, after picking up too many food items! The popular two-player co-op mode returns from the first game, so grab a friend and have a blast! Well i knew this was coming but i didn't expect it so soon. Not exactly essential for me since i already own the anthology version although the slowdown in this game can be quite annoying. Soon? I didn't expect it to take that long, actually. Awesome. This is easily the second best in the series (not counting X). Why does the character selection screen looks soo drugged? In Metal Gear 7, it looks perfectly fine but in this selction screen looks soo demented. But of course the game is good and thats what matters to me. I hope it come out soon. @Cooldued. Metal Gear 7? I thought Hideo Kojima made it certain that the series would end at #4. Anyway, I'll probably get this, because I loved the original Metal Slug. But I don't know if I can afford to DL the whole series. How much better is it from the original? I would just settle for the Wii collection, but that one doesn't let me use the Classic Controller. @Wariofan. I din't know if they can (or will), since it was arcade-only. 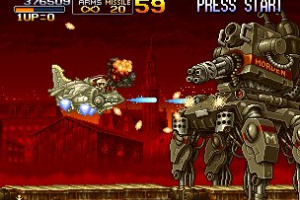 But it would make for one hell of a bonus in Metal Slug 7! Yeah Im hoping maybe they'll either WiiWare it or maybe just go ahead release it as a NeoGeo VC game anyway. Somehow. Would 6 have been possible on NeoGeo? If it werent for that damn 6 I wouldnt be on the fence about Anthology vs VC! I'm debating whether or not I should get the Anthology too. If they just added CC support, I wouldn't be having this problem! It comes out in Japan in October. As for the NA & European VC, you could expect it on either late this year or early next year. ok so is this only 1 player there is no 2 player modus? Yes, there is a two player mode in which a 2nd player could join right in almost any part of any stage. 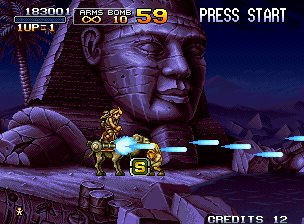 I love Metal Slug 2 despite the slowdown, and would even get just this one on VC even though I have the anthology. However, I'm actually rubbish at it, and need either infinite credits or a checkpoint/save system to get through. What do you get in the VC version? I'm guessing 3 credits, but that's not enough for me. 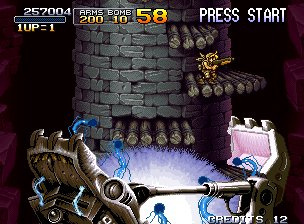 Yeah I too have become a bit spoiled playing the Metal Slug games on my Neo Geo arcade cabinet. I can just set it to "Free Play" and have a go at it. The video seems a little racially insensitive. I'd make a joke here, but I'd probably get banned. @Mr. Cheez- There is GameCube controller support on MSA. There are infinate credits, don't worry. Ediot Edit: Scratch that, you get like 3 credits or something like that. I can't decide. Other than the slowdown problem this game sounds really good. I loved the first one. I don't know if I should just wait for Metal slug X or get this. Who knows how long it will take to get the better version. Does the slowdown really ruin the whole game? The slowdown ranges from bothersome to nearly impossible to play. 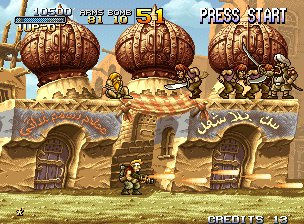 This is still a really solid game and one that you can enjoy, but I'd still recommend waiting on Metal Slug X as it's a much better version of the game. Ok then I'll just wait. Sometimes I wonder If I should have just got the Anthology but I heard the controls weren't so great. 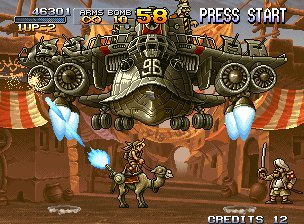 I had never even heard of Metal Slug until it's VC release and once I bought it on the Wii shop I later found out about the Anthology. I too have heard a lot of complaints about the control methods used in the Anthology. To be honest I've become so spoiled being able to play these Neo Geo games on my arcade cabinet that I find it difficult to even use the classic controller to play them on the VC. 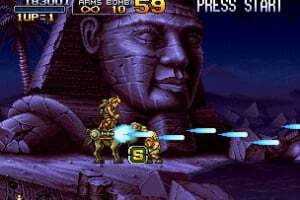 If you like the original Metal Slug, you're in for a real treat with Metal Slug X and Metal Slug 3. They're both outstanding! 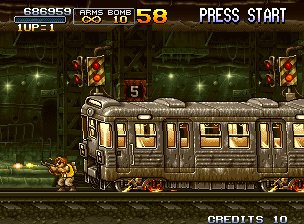 I love Metal Slug. So much so that I bought the compilation for my PS2 and also have the SNK Vol1. 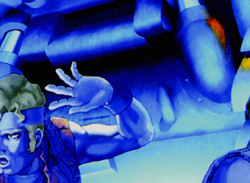 and Fatal Fury 1 compilation. Why don't they start to publish Neo Geo games that are not available on any compilations (e.g. Thrash Rally, League Bowling, Windjammers, Nam 1975 etc)? I love Neo Geo and plan to buy games that I do not have. Unfortunately I cannot invest my points as there are presently no Neo Geo games on VC that I don't have! Does anyone know how many blocks it takes and if HDMI support has been added? @Corbie: Really? The only major slowdown I en counted was during the wobbly bridge on Level 6 but not making it unplayable. 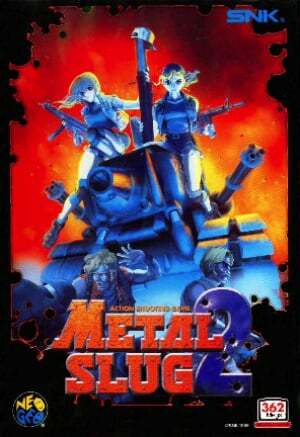 Plus Metal Slug 2 had a better balance than Metal Slug X IMO. 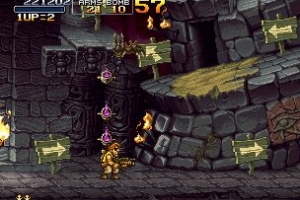 @RadioShadow dunno about HD support but the PAL Metal Slug 2 takes up about 170 blocks. For NTSC regions it's slightly less most of the time. I experienced a LOT of slowdown on Level 3 near the end of the level and in Level 6. I wouldn't say it made it unplayable, but it was damn annoying and made it difficult to know what you had done and what you still needed to do as far as moving around and shooting enemies went. And I think Metal Slug X was a more balanced game difficulty-wise. 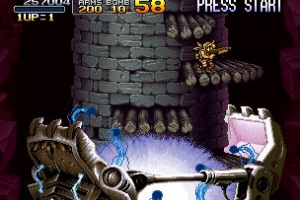 But to be truthful, I spend most of my Metal Slug time on Metal Slug X. I like it even more than Metal Slug 3. 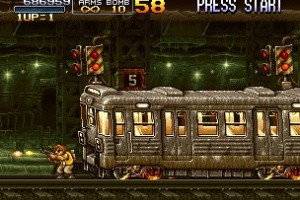 Ah, Metal Slug 2. This is clearly the Arcade version, as the Anthology disc doesn't have slowdown that bad. Though I must say there's some rather exceptional play in this video. That is until he gets zombied and then kills himself. Fitting end, I guess. Makes sense, then, why you prefer X so much over 2, since they're almost the same except X is harder. You start with the harder one, and you'll be upset to find there isn't a challenge when you look elsewhere. I admit that (with practice) MS2 becomes a cakewalk, while other titles in the series (even 6) aren't so easy. "Any other MS fans noticed he didn't get the "Great!" bonus that accompanies finishing a stage without dying? I don't think there were any other requirements." It's not "finish without dying", it's "finish with at least 10 rescued hostages". Since you lose all rescued hostages when you die, that usually means you're not allowed to die after passing a very early point in th stage, though. Basicly a shoot 'em up game, but its one of the best ones! Theres tons of replay value, and if you have someone to play with then its even better! 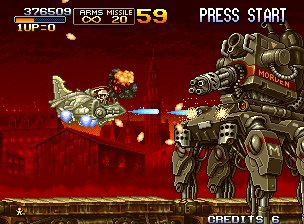 Metal slug is 5/5 but this is 4/5? i think not. This should be rated 5/5! it's more worth it just to buy the Anthology game. It's going for pretty cheap at EB games. 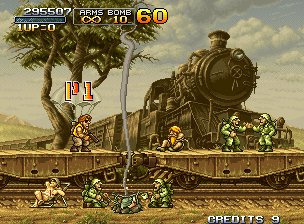 Ok anyone looking for Metal Slug games i recommend buying a PS2 or PSP. The reason is that there is no reason to spend so much for 5 levels that last at least 30 mins (that goes for people that like me are not very good at dodging so many things at once). Its a great game and im not saying its bad but if you do get a PS2 or PSP just buy the anthology like other's have been saying.